Find out more or take the Guided Tour. So is it worth upgrading? Well considering the cost of upgrading, probably not! Moving from the Edge iPhone 2G to the iPhone 3G was less of an issue for many O2 customers, they won’t get the same kind of deal upgrading to the iPhone 3GS. So what about if you don’t have an iPhone, is what was a really good phone even better now with the 3GS? In the past I have mentioned why I did not get an iPhone when it first came out. So do I have the obvious choice, Apple’s iPhone? No, partly as when it came out it did not meet my needs, no tethering, no 3G, no applications. Even the 3G model has some limitations, in the main the poor quality camera and lack of tethering. With the Nokia N95 I can use it as a 3G modem or as a wireless hotspot, likewise the 5MP camera does make it quite capable of taking decent photographs. The iPhone 3GS now meets some of those needs. You will be able to use it as a tethered modem (well if you buy into the right O2 plan). The camera in the 3GS is now much better, 3MP, auto-focus, macro mode and able to take video too! Still not as good as the Nokia N95 camera, but good enough and better than what was in the 3G phone. I suspect that with the 3GS we will see a JoikuSpot type application very soon that will enable you to use the 3GS as a wireless access point. I do think that the voice control and digital compass now add features that students with special needs may find useful in helping them become independent learners and also gain more independence in the community. Overall I do like the new iPhone 3GS, I think it is a great phone to get, but if you already have an iPhone 3G then you probably can live without the extra functionality and just upgrade to the free iPhone 3.0 software. This entry was posted on Friday, June 12th, 2009 at 6:56 am and is filed under apple, iphone, iphone 3gs. You can follow any responses to this entry through the RSS 2.0 feed. You can leave a response, or trackback from your own site. 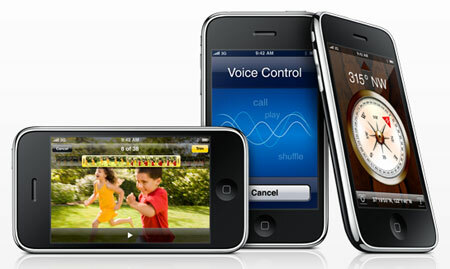 – iPod Touch (16GB) which has some music on it, but I’m mainly using for surfing, Twitter, Apps, and mLearning. -Ipod nano (8GB) is the wife’s, and is currently hooked up to the home stereo and is pumping out nursery tunes for the baby during the day, and music for us in the evening to relax to. So … I have no room for yet another Apple product. I do want a new phone, and I want a decent smartphone for email, browsing, satnav (?) and games … but I can’t see the point of the iPhone as I already have the above. I am really toying with a Blackberry Bold, but keep coming back to the fact that it is simply NOT an iPhone. IMO, not only is it not worth upgrading, it’s not worth the prices O2 are charging full stop. Not that I don’t think the 3GS is wonderful, but it’s just too darn expensive. There are rumours that Vodaphone might be offering the iPhone later this year – I hope so! I have an iPod Touch that I love to bits. I honestly don’t think anything can beat the screen or the general UI and usability of it. That’s why I just don’t really like my n95 to be honest. Twittering and email, web-browsing, etc on it just feels so “clunky” after the touchscreen smoothyness of the Touch. So…when my contract is up I’m eyeing the iPhone. As David says though, 3G or 3GS? The camera quality doesn’t, in all honesty, bother me as I always carry my SLR or my Canon G9 with me anyway, and for “quick snaps” I think the 3G will suffice, despite its shortcomings in relation to other phone cameras (particularly the excellent n95 camera, as you rightly point out). Compass? Erm…righto. Not really much use to me. Having had an iPod touch and now an iPhone, I was surprised by how more functional and useful the iPhone was. I also have an iPod classic (160GB) which has all the music, video and photos and means less drain on the iPhone battery too. Anyone know how the 3G connectivity will work? Having used the 3G capability in the Sony VAIO P and HP 2170 they will probably have proprietary software that needs to be configured manually. I was quite impressed with the way the 3G worked on the Sony VAIO P, and it was nice not to worry about a USB dongle sticking out or draining the battery on my Nokia N95 either through JoikuSpot or tethering. How it will work on the Asus may depend on how they sell it too. They may sell it with the SIM slot free, in which case you can use the SIM Card from any supplier, or they may do a deal with a particular 3G supplier and you have to use their service. That’s what I was asking, do we know yet if Asus will tie this to a single 3G network like the iPhone or is it just a question of buying a SIM and a data contract. If so, how much do data contracts cost? Data contracts are about £10-£15 per month depending on how much data you use on contract, but Three have a pay as you go deal which would also work. With the Sony VAIO P I have been using the SIM card from my Vodafone USB 3G Dongle. However they may do a deal like this T-Mobile one where you pay £25 per month, but the laptop you get “free”. However everything I have read about that Asus, implies that it will be available in the shops as is and you just buy your 3G contract separately. I am also waiting to ‘upgrade’ to a new mobile. I live in rural West Wales and have low coverage with most networks apart from Orange and possibly Vodaphone. O2 Network is nil. For this reason – as I would prefer to stay on a contract I have dismissed the iphone. Rumours abound still about it going to other networks – I have even been told today in a Vodaphone shop that thy may be getting it in July – but couldn’t confirm this. but again am waiting to see who will be carriers for the product. Really don’t want to pay £500 for a phone either.